A great way to save time is to check out our top 10 books on time management. We are dedicated and devoted readers of books to help you create more time. If you have ever thought, "I should read some books to help me get control of my time, BUT I don't have the time!" Then this is for you. We give you a brief summary of what we believe are top ten time management books. Yes, our selection is subjective based on our own experience plus the feedback from our visitors and our time creation coaching and workshop participants. This is one of our favorite time management books because it is about creating an on purpose life. This is not a quick fix -- it is a way of life. Adopting the Seven Habits, though challenging, will enrich your life and give you a sense of satisfaction, control and calmness. The key message on time management is spend time on proactive important tasks rather than being reactive. The 80-20 principle was discovered by Pareto a couple of hundred years ago and it still applies -- in fact it is more relevant than ever. The 80-20 rule is that 80% of your results will come from 20% of your effort. In managing your time this means about 80% of your achievements will come from 20% of your actions or 20% of your time. To implement the 80-20 principle STOP. STOP doing what you are doing now and ask, "is this task in the 20% that gives 80% of the results?" If not DO NOT do it. Eliminate the 80% of "waste" and do the 20%. Your Relationship with Time, Do the right things, Take Command and Other People and Your Time. Brian Tracy is another "guru" who has written many programs and time management books. Starting with his book Maximum Achievement and his audio program The Psychology of Achievement, Brian has been providing valuable on how best to use our time. Time Power covers topics such as Mastering Time through Goals, Establishing proper priorities, overcoming the six biggest time wasters and overcoming procrastination. You will have heard these ideas before, and Time Power puts them together like an instruction manual. It's easy to find what you want and easy to refer back. The approach is based on having a lot of self-discipline (all people who spend time well have self-discipline, but Tracy places very high importance on this ability). Bossidy and Charan explain how it is how you Execute in business that is the difference between success and failure. They use three examples from XEROX, Lucent and EDS to make their point. The key take away concept from this book is about getting things done through others. The two stand out factors for us were Accountability and Follow-Through. This is a great story about how most managers and supervisors operate and why they don't have enough time. Indirectly this is a book on time management because the outcome from using their suggestions about managing tasks and responsibilities means you will find you have lots more time! And the story behind "who's got the monkey" is entertaining too! This book is a great practical hands-on book for improving your time-management. It starts by checking on you motivation for wanting to do stuff. The two great ideas we like in this book are the WADE formula and the concept of time mapping. We use both of these as part of our coaching toolkit. W = write it down. A = add it up (how long will it take). D = decide (to do or no to do). E = execute. To round out our 10 time management books we have included a short fun book. Brian Tracy gives us short simple and practical stories and ideas for improving productivity and time management (like how to eat that frog). It is a great time management tool you can refer to at anytime and get some practical suggestions, without having to read through a long book. One of our favorite tips is "before you eat the frog, set the table" -- in other words get clear about want you really want BEFORE you start taking action. We hope that these short summaries on our top ten time management books have been useful for you. Come back soon for new book reviews. All books reviewed at Time Management Central are available from Amazon. 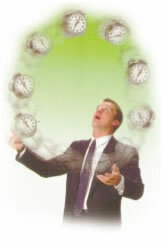 The latest time management information and time management research.